Day two of the bathroom tile work is underway. Tawn, the handyman, and I spent ten minutes discussing the different options for how best to arrange the tile. It is kind of hard to explain, and I’ll post pictures about the whole process once it is done, but the challenge is in how the shower glass and tile floor come together. For some reason, building a lip like you have in western-style showers is just beyond comprehension here. Plus, it would require us to replace the glass we currently have. Anyhow, while I wait for that project to come to a (hopefully satisfactory) conclusion, I want to share a picture that I took of some new year’s decorations at Siam Center mall. 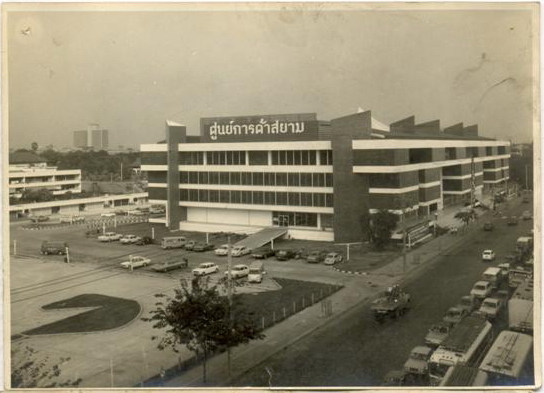 This was one of the first malls in Bangkok, dating back to 1973. It has undergone countless rennovations (two in the five years since I moved here) to keep it fresh for the young crowd and it has managed to remain popular. 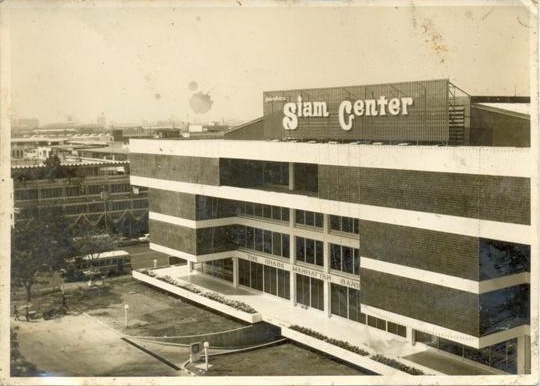 Siam Center as it looked shortly after its opening in 1973. On the right is Rama 1 Road (which becomes Sukhumvit further east). The space on the left is what today is Siam Discovery Center and a multistory car park is back behind (to the left in this picture) of the malls today. Siam Paragon, which was built on the site of the former Intercontinental Hotel, now sits down the street (to the right in this picture) of Siam Center. From another angle looking towards Rama I Road and Siam Square on the far side. This picture is taken from roughly where the large LED video screens are in the plaza between Siam Center and Siam Paragon. 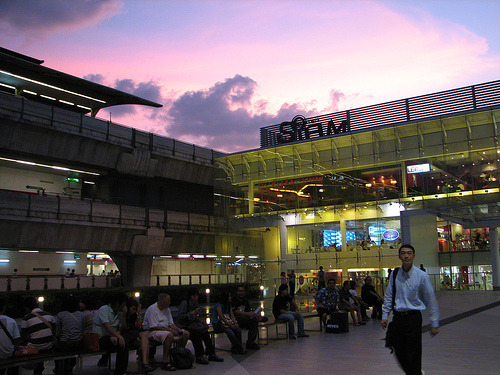 The same side of the Siam Center mall today, with the Siam BTS Skytrain Station in the background. Amazing how young and fresh Siam Center looks. Must be the availability of inexpensive, high quality face-lifts here in Thailand! The mall has three four-story atrium areas and these are currently decorated with these large signs as well as smaller shapes. At first they didn’t catch my attention. But as I looked more closely I started to wonder what they were made of. It looks like color pencils. This entry was posted in Uncategorized and tagged Bangkok, Center, Decorations, Siam, Square, Straws by christao408. Bookmark the permalink. Nice to see an update of Siam Centre, I had many good memories walking all over the shopping malls around there! A yeah sign made with colorful strawn, YEAH! good idea and it does look refreshing. Did there used to be another hotel near that site that has long since closed down? The straws are interesting and if you zoomed in the last picture, I think it would make an interesting pattern.Good luck with the reno. I seem to recall an old video about the water not flowing properly to the drain because the tiles aren’t slanted properly. I can’t wait to see the pictures & video of your renovation. Never stepped foot in Siam, but your pictures definitely peak some curiosity. As I was reading, I was gonna say I hope it’s not pencils. That would 1) be very heavy and 2) hurt if it falls.That sure looks like it takes a long time to make. that’s a lot of straws! 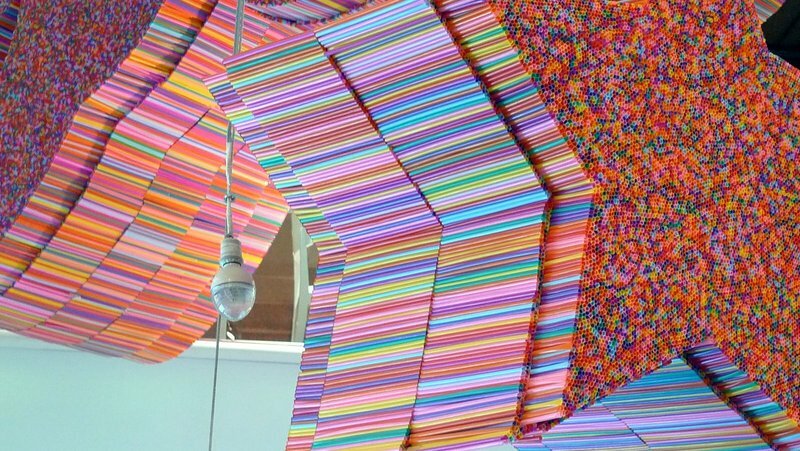 pretty awesome, but i’d hate to be the person who had to glue all those together and figure out how to arrange the straw colors. Love those straws – what a unique idea! Good luck with the tile project….those are never easy. I don’t think we ever went to the shoppping mall when I was there…although I can’t imagine that I ignored the grand opening of a new mall!!! 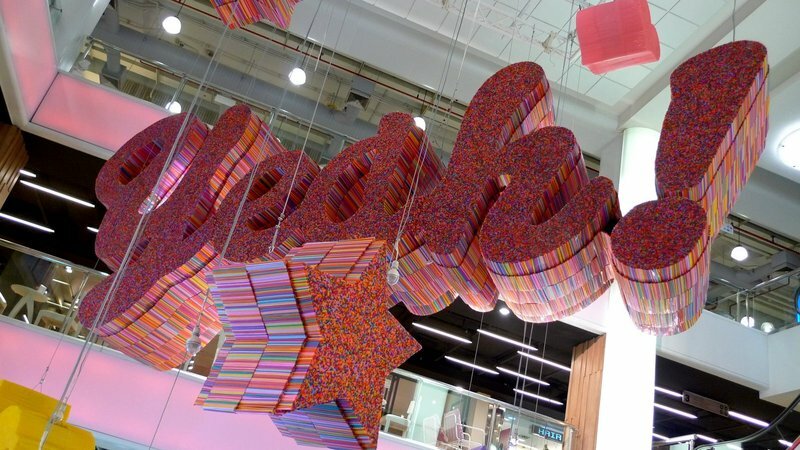 And I agree that making those decorations with plastic straws would be VERY tedious…I wonder if the straws are made of recycled plastic bags, much like the woven purses that I bought ( and still have at least 2 of!! ) when we were there!! That is a very pretty mall… Impressive, how they kept it up! Interesting idea with the straws. I understand using the plastic sheets and gluing straws to them for the flat sides, but am curious about the “end” sides. How the heck did they attach the straws to get that look? Perhaps making a frame with the plastic sheets, then filling in the middle somehow. Hmmm…interesting problem to ponder. Lot of straws to make a beautiful pattern. I wonder who thought of the idea better who had to put it together! Hopefully I get to check it out this year! Very creative but I would imagine the amount of work that went into it. Wow~ look at that color! I cannot even conceive how long that last art project took~Looking forward to your own tiling project! @ElusiveWords – You’re thinking of the Siam Intercontinental Hotel, the lovely garden grounds of which used to be just to the east of Siam Center. Shortly before I moved here they demolished the hotel and started construction on the Siam Paragon, a mall, convention center, and hotel complex.